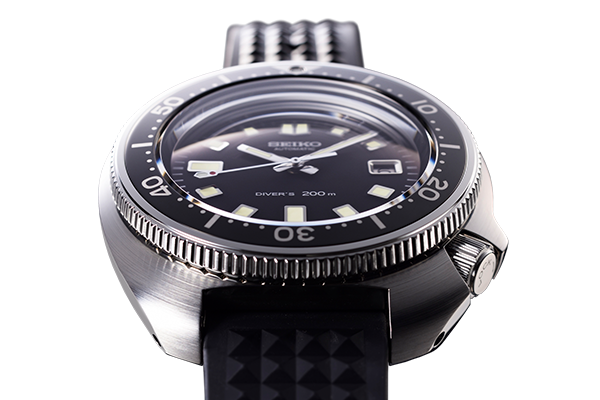 Dive watches have been synonymous with Seiko for many years and there have been numerous high profile releases at Baselworld in recent years. 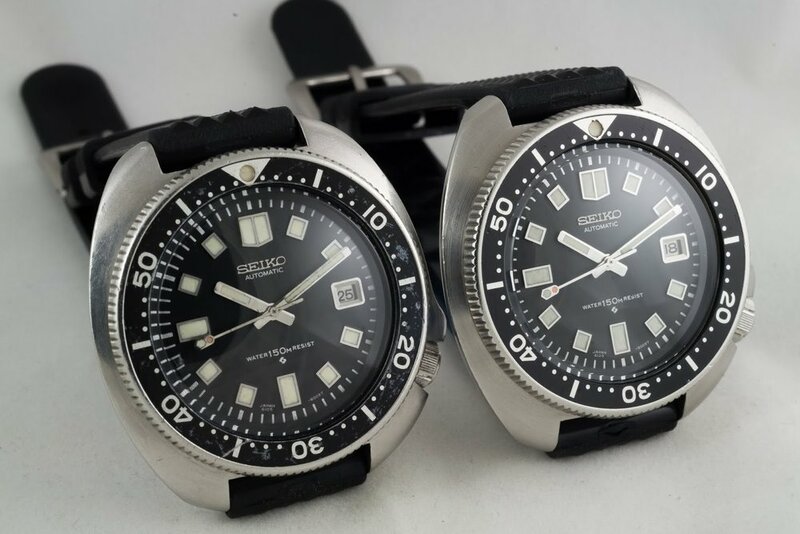 In 2017 Seiko released the SLA017 a recreation of the 62MAS (6217-8000) and last year the SLA025 recreation of the 6159 010 (6159-7000). 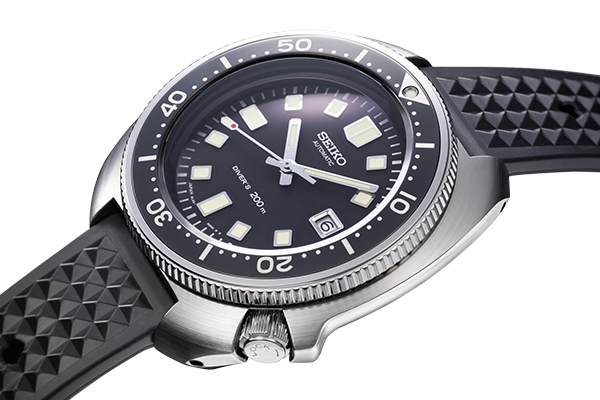 This year Seiko continues the recreation of their classic diver models with the SLA033 (SBDX031 JDM) based on the 61MC 022 (6105-8110). The original 61MC 022 was released in 1970, forty nine years ago, and was the successor to the 61MC 010 (6105-8000) that was released in 1968. The main difference between these models was the shape of the case. The 61MC 022 introduced a very distinctive asymmetrical case shape with a large crown guard that makes the watch instantly recognizable. This same case shape is reproduced in the newly announced SAL033 but this is slightly larger than the original model. The stainless steel case has a super hard coating and the top surface of the bezel is zaratsu polished. The watch is assembled by hand in the Shizukuishi Watch Studio where mechanical Grand Seiko models are also created. The original model is often referred to as the Captain Willard watch by many fans as it was worn by the character Captain Benjamin L. Willard played by Martin Sheen in the movie Apocalypse Now. 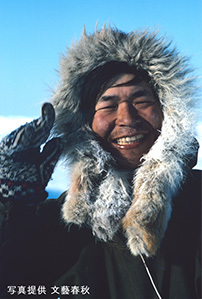 In the Japanese market the watch more commonly has the nickname of “Uemura” that is a reference to the Japanese explorer Naomi Uemura who wore the watch during his 12,000km solo dog-sled journey from Greenland to Alaska. Surprisingly this year there seems to be no announcement of a general released model that is inspired by the same model as the limited edition. This has occurred in previous years so hopefully this is something that Seiko will announce at a later date. 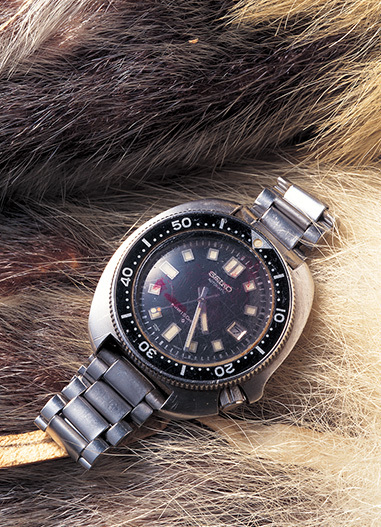 In addition to the SLA033 Seiko also introduced the new Prospex LX range. There are six models in the range that are separated into three different categories, with models tailored towards the sea, air and land. Last year the SLA025 won the Sports Watch award at the Grand Prix d’Horlogerie de Genève. Taking the design queue from this model the new LX range uses the same general design but this has been updated with some changes like altering the angle on the upper side of the titanium case to highlight the Zaratsu polished surface. The LX range was developed in collaboration with Japanese industrial designer Ken Okuyama who runs the Ken Okuyama Design company. Okuyama-san has previously worked as the Creative Director at Pininfarina where he supervised the design of the Enzo Ferrari, Ferrari 599 GTB Fiorano, Ferrari 456M GT, Ferrari California and various other vehicles. He has also been involved with the design of various Japanese Shinkansen trains. The three different styles of watches in the collection are a diver, and two models with GMT functionality and a bezel featuring a 24 hour bezel or compass points. Traditionally I think these models would have been branded as Marine Master, Flight Master and Land Master but this naming convention is not used for this range. Each watch type is available in both a bright titanium case as well as a blacked out monochrome version. All models are available from July and are ongoing additions to the Prospex range not limited editions. The first model is the SNR025 with a black dial, yellow GMT hand and bi-directional bezel with compass bearings. The watch is powered by the 5R66 Spring Drive movement and comes with a titanium bracelet, three-fold clasp with push button release and slide adjuster. Complementing this is the black SNR027 version that is supplied on a calf strap. The diver model is the SNR029 with a black dial and bezel insert. The watch is powered by the 5R65 Spring Drive movement and is supplied on a titanium bracelet with a three-fold clasp with push button release and slide adjuster. The black cased version of this is the SNR031 that is provided on a silicone strap. The third style model in the LX range is the SNR033 with a 5R66 GMT movement and a 24 hour bezel. This model is supplied on a Titanium bracelet with three-fold clasp with push button release. The blacken version is the SNR035 that is supplied on a crocodile strap. Here is the Japanese promotional video for the LX series. This new LX series is clearly targeted towards the high end of Seiko’s sports watch range with Spring Drive movements and zaratsu polished cases. The pricing places these models at the top of the standard Prospex line up but they do utilize top level finishing and materials. Many fans may be surprised by this positioning but it should be noted that these models do not replace any of the existing models but instead just add to the range and provide new choices for customers looking for models higher in the lineup.